I’m on an Aer Lingus flight back from Ireland. My co-founder Joanne and I were honored to be hosted for our travels by Enterprise Ireland, the government-funded business development organization. They were hoping we would discover some Irish products to launch to the US market. Here’s a random photo gallery of our trip. 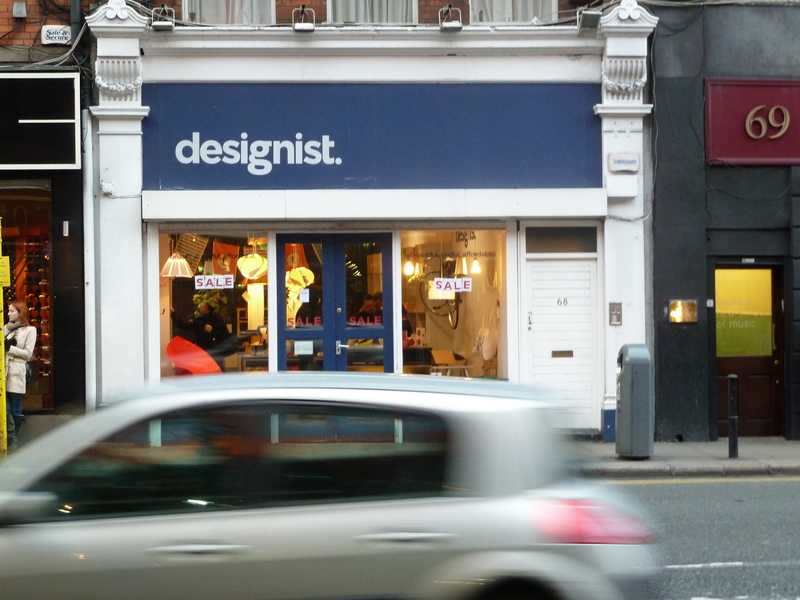 I bought a couple products at this terrific Dublin shop, Designist, featuring affordable European home product innovations. I had no idea that some of the items I bought at Designist were designed and manufactured by this pair of entrepreneurs from Shanghai, now living on the northside of Dublin. 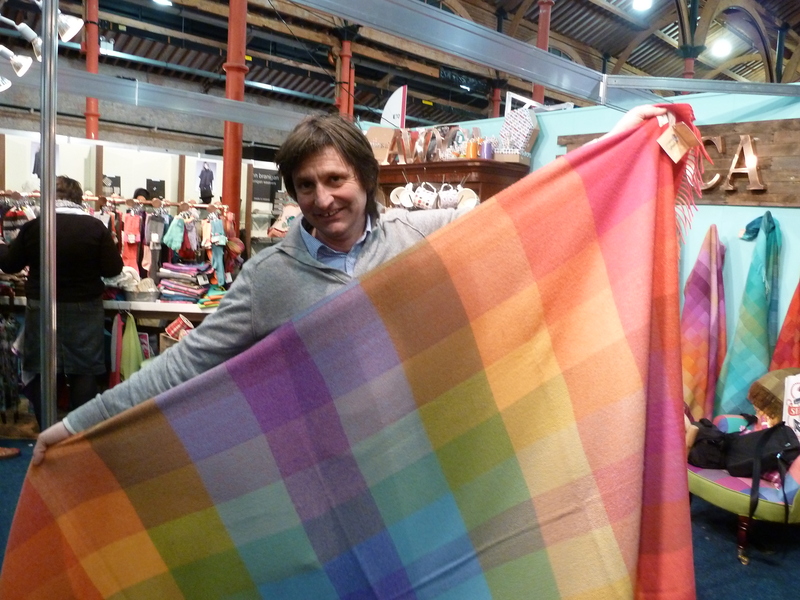 It was only when attending a trade event, Showcase Ireland, that I made the connection. How refreshing! The Chinese people I knew when I lived in Dublin were largely students. Some of them are obviously settling right in, a few years later. This is a huge sea change for Ireland. It was so homogenous when I first lived there that when I saw a black, Asian or overweight person I automatically assumed they were a visiting American. 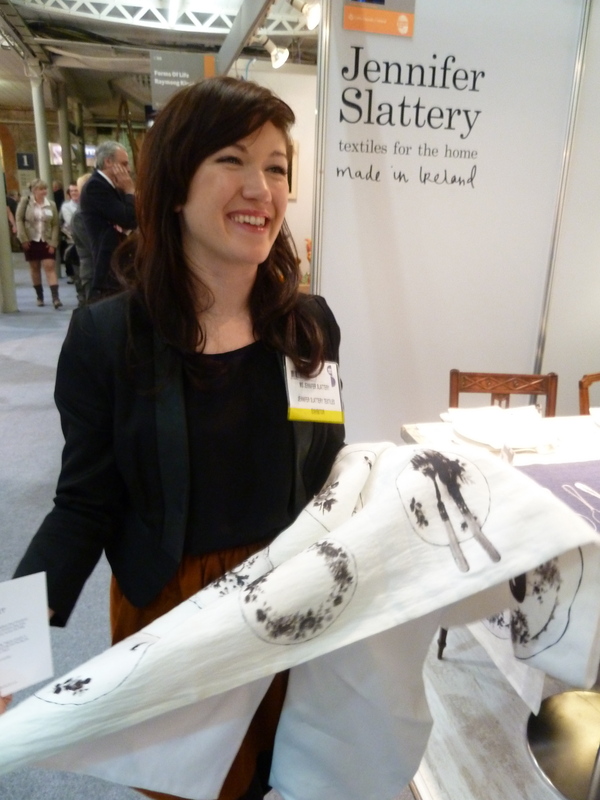 Similarly, this woman was putting a modern spin on Irish linen, but using very fine age-old manufacturing techniques. This black box is not a mistake. It was supposed to be a picture of us with the President of Ireland. He was scheduled to speak at noon on Sunday at the show. At 11:40 we started looking for the assigned room. We were told…”Oh he’s just after finishing. He did it early. You can probably find him walking around the show.” That was true. We never did find President Higgins, but we found an official photographer who showed us shots of him mixing and mingling. No Secret Service. Just the Pres rambling about, having a chat here and there. Alas, Joanne’s visions of a very stunning and impressive Facebook post were dashed. 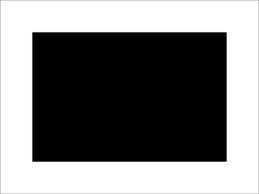 All we have is this black box. My very favorite Irish brand is Avoca, founded in 1723. It is one of the oldest continuously operating manufacturers in the world. It’s known for its woven blankets, and wonderful fashion, but it’s also a dynamic retailer, and a superb restaurant operator. In my estimation, contemporary companies like Anthropologie–as great as they are–are only copying Avoca. It’s the original. Thus, I was very thrilled to meet one of the company’s family members, Ivan Pratt from Avoca. Avoca is so inspirational to me. 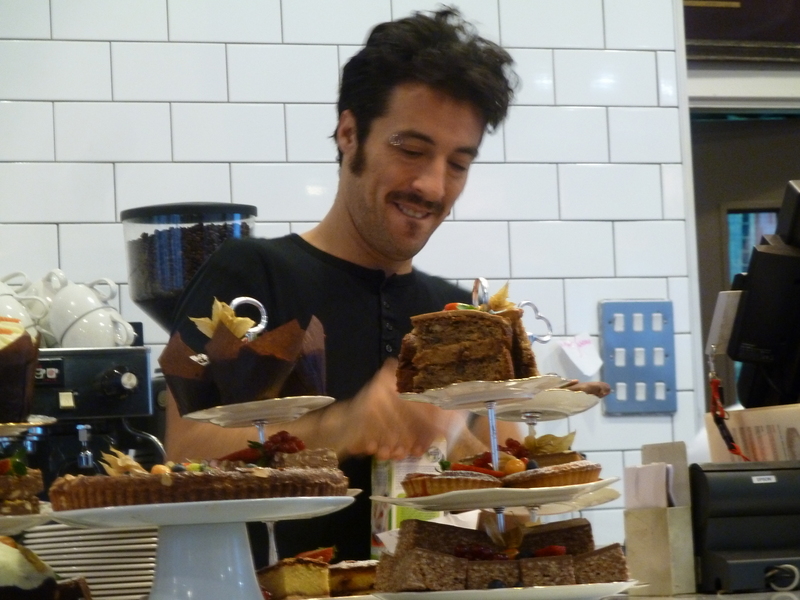 Their cafes are full of delicious, freshly prepared food. 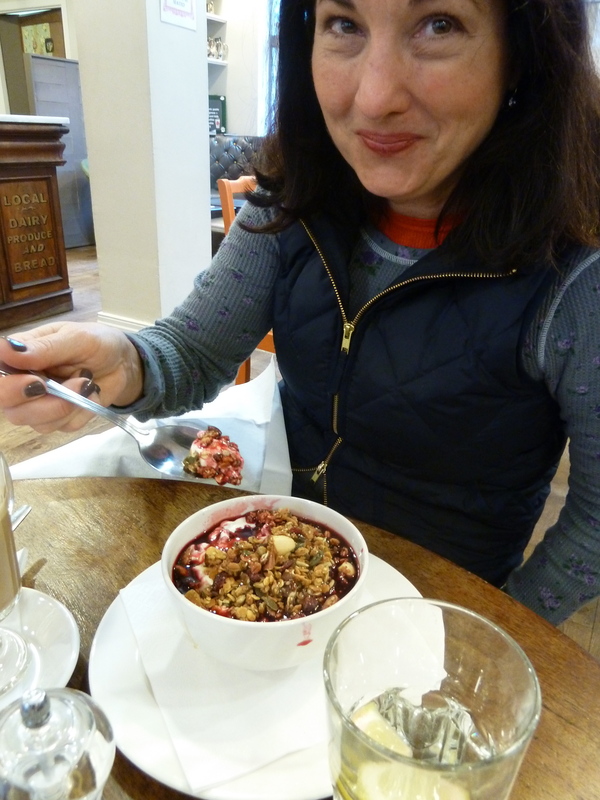 Joanne and I had to visit TWICE to have this berry compote served with greek yogurt and an amazing homemade granola loaded with bits of citrus and big fat nuts. Alas, Avoca does not sell it outside of the cafes. If they ever do, it is a Grommet for sure. I owe it to my countrymen. Organic “Crackers” eggs (probably harboring a fair quantity of rich Irish grass-fed cow butter) were a revelation. They really are life-changing. 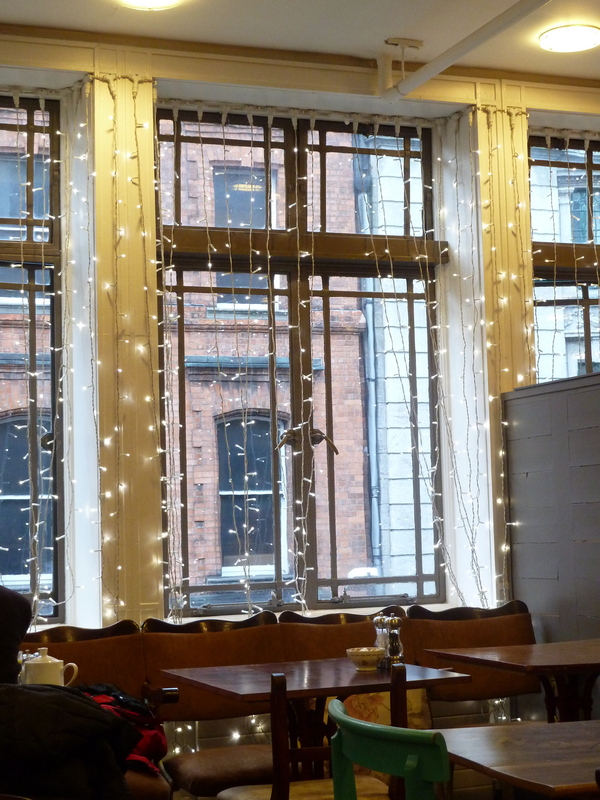 And I solved a personal decorating dilemma at the Avoca cafe–how to cover some huge windows in a family room that have been annoyingly bare since they were added in 1998. (I can be crazy patient about doing “without”—until I see what I want. Then I go on a tear.) This simple use of fairy lights is going right into my home, possibly covered with some thin filmy voile to create a bit of mystery. No reason for the photo of this Avoca baked goods counter. I just thought the café worker was adorable. 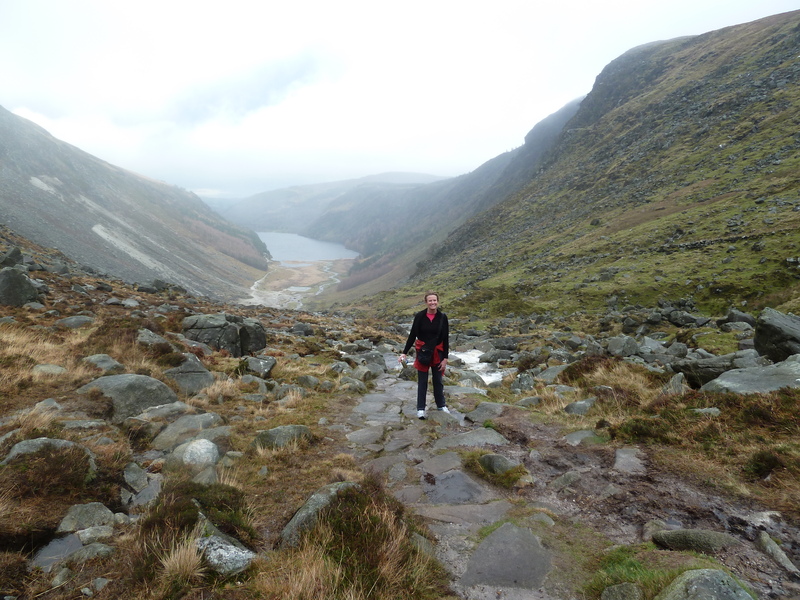 No visit to Ireland is complete without a misty mountain walk. 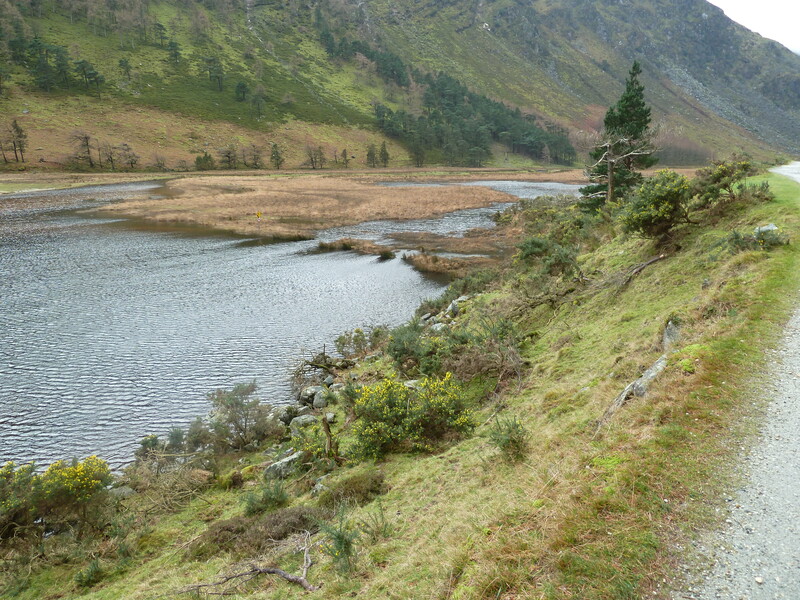 This was taken at Glendalough. I am NOT sharing the photos of our late nights with friends new and old. But they were plenty! That is the true treasure of Ireland. Its social life and its sociable population are my favorite “products” of the land. 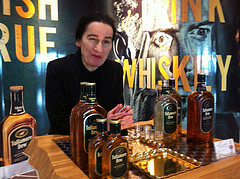 I should be your “eye-on-Ireland” for this stuff; not that I would want to take away an excuse for you to visit! I love the Designist shop. See also the Temple Bar/Cow’s Lane designer outdoor market http://blog.templebar.ie/?p=4761 and the Ferocious Mingle Market on Thomas Street which should be included just for its name’s sake (lots of quirky/arty stuff also). Clodagh–I totally want your “eye-on-Ireland”. You know Grommet like the back of your hand at this point and we’d be interested in anything you surface. Remember you also have European products we don’t know about too. We did go to the Cow’s Lane Studios and loved it, as well as Industry. I had not heard about the Ferocious Mingle Market. You are right…what a name. I love seeing that this move to indie, local, sustainable, witty, is global, or at least hitting the western world broadly. This was much less true when I lived in Dublin. Food was moving that way. Now it is everything. We’re all growing together. The Irish Design Shop has lovely things https://irishdesignshop.com/ . I think Jane Walsh’s jewellry hits a Grommet spot http://www.madeinwestmeath.ie/portfolio/button-studio. 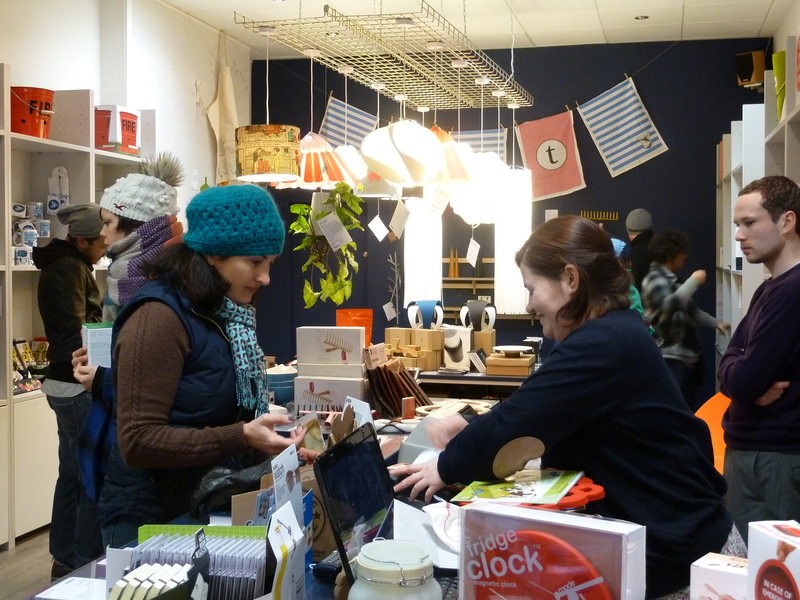 I’ll use the Daily Grommet as an excuse to visit interesting design and crafts people. Great post! 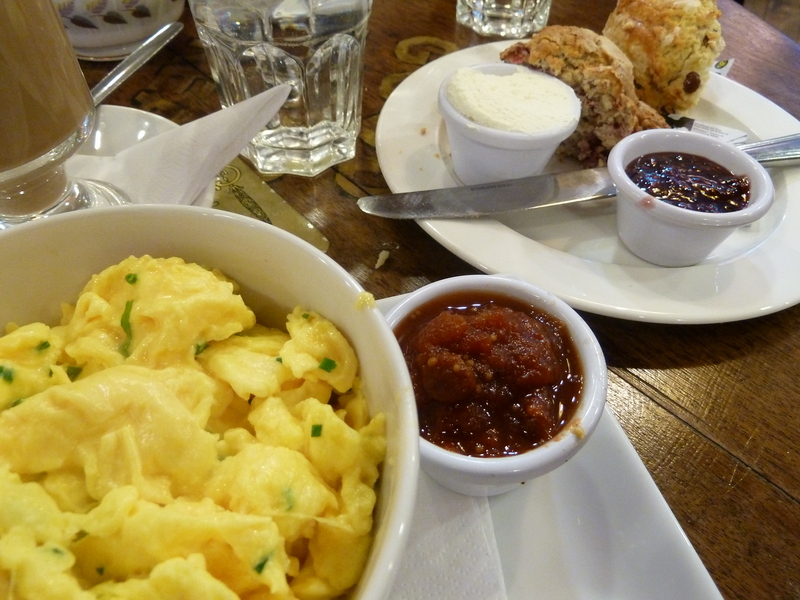 Making me even more homesick for the place than I always am anyway… Avoca really is the best! Sarah, I really did not want to get back on the plane. I could have moved right back in to Dublin. It’s better than when we lived there….the sillier prices came down, the restaurant food quality went up. Nice combo. Of course I was not one of the 14% Irish unemployed trying to survive with a bloated mortgage or other obligations. I was just a tourist gadfly on this trip.